The Family YMCA was founded by volunteers in 1955 in Los Alamos. At that time, Los Alamos was a “closed” community due to the top secret work of the National Laboratory, and the isolation and lack of activities were community concerns. This put The Family YMCA on the historical map for two reasons. For one, our Y came into existence through an Act of Congress. Community volunteers had to petition Congress for a donation of property because all land and buildings were federally owned since World War II's Manhattan Project. The other historical fact is that The Family YMCA is the unique name ascribed to this Y located in Los Alamos. 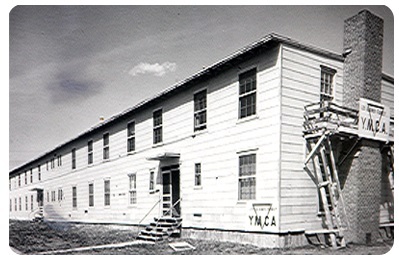 Ours was the very first “family” YMCA in the United States of America. Since 1955, some 480 of the U.S.’s 2,700 YMCAs, now incorporate the word “family” into their name, but our Y was the first one. The mission of our organization is to build individual, family and community strength by focusing on youth development, healthy living and social responsibility. Our purpose is to engage partners in our communities to promote healthy life choices and to support community well-being beyond our facilities. We serve approximately 8,000 community members annually in memberships and through health-related programs. Our annual budget is $2.7 million dollars. The parent organization of The Family YMCA is more than 167 years old. The Young Men’s Christian Association (YMCA) was founded in 1844 by George Williams of England who sought to offer Christian social and fitness alternatives to the vices he perceived during the Industrial Revolution. Thomas Sullivan, a sea captain, brought the movement to the United States in 1851. The YMCA has played a significant role in history: basketball, volleyball, racquetball, group camping and group swimming were invented by YMCA directors. YMCAs helped found the USO, Boy Scouts of America and Camp Fire girls. Today, the YMCA is inclusive of all individuals regardless of gender and religious beliefs. In the U.S., the Y is comprised of YMCA of the USA, which is a national resource office, and more than 2,700 chapter YMCAs with approximately 20,000 fulltime staff, and 600,000 volunteers that engage 9 million youth and 12 million adults in 10,000 communities across the U.S.
First organizing committee met and a temporary board of directors was named. An organizing board was established. The YMCA accreditation application was sent. AEC provided use of T-18 building to the YMCA at the price of $1.00 per year (with utilities included) as long as the YMCA would maintain and repair the building as needed. 10/1/55 was Ray Catan’s first day on the job as YMCA Executive Director. 10/30/55 was the first official YMCA board meeting in which Jesse Rose was elected as YMCA Board President. The YMCA was moved from T-18 to the Gamma Building at 15th Street and Central Avenue. The Y was accepted into the United Way, then known as the "Community Chest." Early Y work included hosting a local community calendar. Programs were operated in conjunction with the county recreation program, and were funded until 1962 by county grants. The Y became independent from the county. The YMCA was moved to a dorm building at 15th Street and Iris Street under an AEC lease, which is its current location. Phase I was scaled down and produced approximately $88,000. The concept of the Swimming Pool was passed to Los Alamos County in hopes that the construction occur on YMCA property. The YMCA offices were moved again to the Miles Building, rent free, for the duration of the construction of the new facility. Four acres of land were purchased at 15th and Iris streets from AEC for $5600. The new all-purpose YMCA facility was dedicated and opened. The total cost of the project was $51,358. 6/11/68 - Opening day for the new health club facility. Two handball and two squash courts were opened along with the new lobby area, weight room, an aerobics room, a small shower area and a larger shower room with a steam room (that was alternately scheduled for men and women's use), and several small administrative offices. The YMCA officially went from being 10% self staining in 1961, to 100% self- sustaining. Swimming classes were held at Bob Waterman’s Condominiums pool across the street from the YMCA at 15th St. and Iris St. The YMCA became a United Way organization as recipients. A temporary building was placed on YMCA property to house the Los Alamos Family Council. The YMCA declined offers to lease or buy the playing field at the east end of the post office. The YMCA began keeping $650,000, 10 7/8% from a 30 year loan, to build a swimming pool. The YMCA continued to try and finance $1,015,000 for a new building and a swimming pool. The main YMCA opened a satellite branch in White Rock. The White Rock Branch had 5,000 square feet of rented space; it included an aerobics room, 2 weight rooms, a child care room, a small meeting and class room, and a lobby area. This branch closed in 1990 due to the high cost and low usage. The swimming pool project was dropped and remodeling projects began to be discussed. The YMCA was completely renovated and expanded. New locker rooms, a whirlpool, a new racquetball court, and an aerobics room were all added to the facility. A capital campaign to build a pool fell far short of goal. Instead, a racquetball court was added, and the Weight room and Aerobics room were enlarged. A proper aerobic floor was installed. Large and modern locker/shower rooms were added, as well as a large spa area with a Jacuzzi and steam room. The new lobby included an area for a pool table and foosball, and the old lobby became a multi-purpose room. The first YMCA membership cards issued. They were laminated and include the members name and a bar code. The YMCA replaced the “old” vans with new ones. April: At the request of LAPS, a trade agreement was made between them and the YMCA to provide aerobics classes for school employees in exchange for usage of space for Before/After School programming. October: A request by the schools was made to extend usage of the YMCA to the entire facility, not just for aerobics classes. The First Annual YMCA Family Fun Run was held during Red Ribbon Week. The First Annual YMCA Bench Press Contest was held. The first shipment of “bench steps” was received for the first and ever popular Step Aerobics class. A new trade agreement was made with LAPS that granted them access to the entire facility. The YMCA before/after school programs became recognized licensed care providers by the State of New Mexico. The Family YMCA's story was featured in the national magazine, Discovery YMCA. In late 1993, the weight room was completely renovated and all the old equipment was replaced with new Cybex machines. The lobby was sacrificed for a "cardio" room, and a treadmill and several Stairmasters were added, as well as new stationary bikes. This prompted a 65% growth in membership. In late 1994, serving more members and non-members than ever before with classes and programs, a capital campaign with a goal of $1 million was launched to raise funds to expand and renovate the existing facility. The pledge period for the campaign was five years. The expansion plan included a climbing wall and a gymnasium. The first photo I.D.’s were issued to members. The finalization processes of the “climbing wall” plans were being made. The YMCA launches a capital campaign with an aggressive goal of $1,000,000 to build a gymnasium addition on site. In April, The Family YMCA invites the community to the groundbreaking for the renovation and expansion project. A little over $500,000 of the million dollar goal was pledged. In May, a 3,000 square-foot space was rented from the Netuschil’s in Central Park Square to expand programming and free up room at the main Y. The move provided an expanded cardio and weight room at the main facility. In June 1997, the 900 square-foot, 32-foot high climbing wall is added to the south side of the facility. The Climbing Wall has a grand opening in August. In December, a special use permit is turned down for the Y gymnasium construction to be east of the building. The gym is moved north of the main facility causing cost to increase. The first Red and Black Ball was held to help raise funds for the gymnasium. The YMCA stops leasing the Annex space in May, in preparation for a move to the new gym in October. In the fall of 2001, a 5,700 square-foot gymnasium is added to the North side of the main facility. The Annex was closed and classes moved to the "main facility." A 28-passenger activity bus is purchased for expanded programming with the help of annual campaign funds and a generous gift from the Washington Group. The Family YMCA operates a summer camp at James Rodriguez elementary school in Española. The Y enters a partnership with the City of Española to operate a Teen Technology and Recreation Center that opened on October 15, 2007. It is supported by several funding agencies. Awarded a grant from New Mexico's Youth Conservation Corps to employ 18 youth from Española and Los Alamos to improve fire line trails, address wildfire erosion problems, create new trails and build friendships among these neighboring youth. Strong Kids Golf Classic held in June 2009. Phases 1 and 2 of a three part expansion plan is completed by the "bump-out" of the cardio room, conversion of a part of the spa area to offices, and the expansion of the circuit room. An office is rented off-site for program staff. Los Alamos County awards the Y a contract to operate a Teen Center. It opens in January. The Center is a result of a grass-roots community effort expressing a need for support of teenagers. It is located across from Los Alamos High School, on the ground floor of Trinity on the Hill Church. The Y signs a contract with the County for the administration of the Teen Center and programs serving teens. In July, the Y completes phase 2 of a facility remodel and update: final expansion of Cardio room, HVAC throughout the facility, offices opened in the converted spa area. The cardo room doubles in size. Phase 3 begins: remodel of locker rooms and lobby. In March of 2013, the Y Express opens across the street at 140 Central Park Square, adding 600 feet of functional training space and 1,361 feet of group exercise space. Two staff offices are located at this site. In May, the Y opens an exercise studio at 106 A Longview Drive in White Rock, which closes in 2016 because classes didn’t fill. In July, the county grants the Y an acre of land to host an educational garden near the North Mesa Tennis Courts as part of a grant from Los Alamos JJAB and State Farm Corporation. The Y withdraws from the LAC Garden lease in 2016 when the property is considered for other recreational development. In August, Los Alamos County completes a Capital Improvement Project, renovating the Community Building and creating an enlarged space for the LA Teen Center operated by The Family YMCA. The Family YMCA conducted a Diversity, Equity and Inclusion self-assessment provided by The YMCA of the USA. At the time, we became the 72nd of 2,700 YMCAs to earn the Diversity, Inclusion and Global innovation Y status. Additionally, a YUSA’s employee resource group named The Family YMCA a Champion of LGBTQ (we were the 13th of 13 Y’s to achieve that status at the time.) Our Y has a standing DIG committee where we are forwarding local initiatives.